Steel wool - Go get some at the hardware store or order some online from Amazon.com. I ordered six bags and am probably going to get more later. Get Grade 0, 00, 000, or 0000. Don't get anything at or above Grade 1. Steel cable or chain - Can be found a thrift store or grocery store. I bought a steel cable dog leash with plastic lamination covering the steel and a clasp at the end of the cable. I use the clasp as a handle. 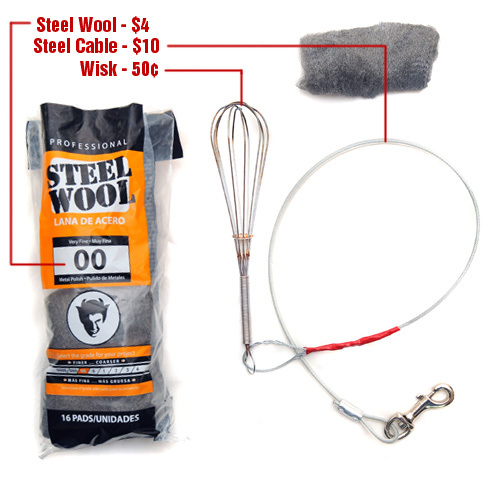 If you use just a chain you can skip out on the cable and the whisk all together and just shove the steel wool around the loops in the chain, it just takes longer to do that. Whisk - I found mine at a thrift store for about 50 cents. Any D-SLR Camera and Tripod - 'Cause like, you need to take the pictures somehow. Lighter or 9 Volt battery - This is used to light the wool on fire. Next you need to build your cage to hold the steel wool. I grabbed the whisk and then attached it to a high quality steel cable that I found at Bi-Mart for $10. The cable was about 20 feet long (originally meant to be used as a dog leash), and had a clasp on each end. Cut the cable so it is about the same length as your arm. After it's been cut, you'll have only one clasp attached to the end of your cable, but at least the cable isn't 20 feet long anymore. I stripped the plastic laminated protective covering about 1 foot down from the end that had no clasp and then untwisted the cable into two different clumps. After that, I looped and weaved one of those clumps back into itself until it pretty much locked itself back up, then twisted the next group around the first one and taped it up at the base of the loop for extra support. If you don't want to make it all nice and fancy like this, just take a chain and cram some steel wool in and around the holes. Next, light the wool on fire by using a lighter or by rubbing a 9 volt battery against it. The wool will start sparking but won't really produce any flames. Shake the wool around to help it burn. In order to create the orb shape, spin the cable around in a circle and then start orbiting your body around the pivot point . Spinning around in just a circle without orbiting around the pivot point will just make a 2D Circle, but these are just as awesome as the 3D orbs. For safety, wear a hat or hoodie, long sleeves, long pants, shoes, gloves, and goggles. Wearing all black is the most strategic, because the camera will have a harder time seeing you. I usually just wear shoes, pants, and a sweatshirt with a hood and skip on the goggles and gloves. Have a fire extinguisher nearby in case a spark accidentally lands on a patch of dry grass, it can and WILL catch on fire, especially if you are doing this in dry conditions. Wet conditions are much more safe. I've spun wool on top of patches of grass right after rainfall and everything was fine. Spinning wool in remote places helps because it draws less attention to yourself. I've done this on a public beach before and a ranger came and kicked me out. So... if you get a ticket, don't blame me. 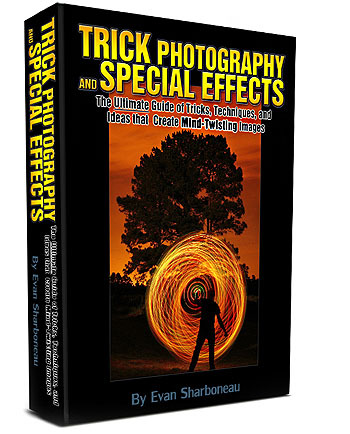 If you liked this video and blog post, be sure to check out my e-book and video course: Trick Photography and Special Effects. There are dozens of more tricks in there. In the video, Mr. Wizard (a former middle school science teacher) unrolls a section of fine-grain steel wool, clips it vertically to a stand, and lights the bottom of it on fire. The fire slowly eats its way up the curtain of steel wool, looking almost like a reverse waterfall of fire. 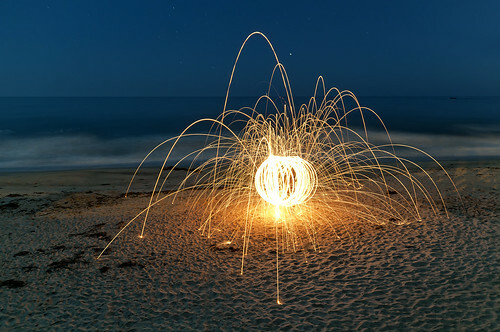 There are a lot of really cool things that can be done with this because it doesn’t spark nearly as much, and there are a lot of ways and designs the steel wool can be laid out to create. I have been wondering how to do this. I know of a few people posting some cool steel wool pics on Instagram. I want to use this when doing a vehicle photo shoot at my shop. How much do you have to worry about the burning wool catching something on fire when it lands? wow! Finally someone who made a GREAT, easy to understand tutorial! Nothing left out. Step by step! Thanks!!! Wow!! Thanks for the tutorial. It was very easy to understand and follow. I’ll be trying this once I have the right camera!! Great job! Your ebook and video content is well worth the money. It is so unique and you have provided so many different areas of photography for those seeking to learn more. Your videos support your 2nd edition so extremely well. I have learnt so much thanks for putting it all together. It’s first time when I am reading about mirror knitting. I enjoyed very much while watching this video. Great work and a great tutorial! I have two questions! First of all i would like to know the time in the first picture. I love this low light before night. Secondly, what about the distance from the camera and the mm in lens? I want to feel safe in order to keep all this show inside my picture dimensions and of course flames radius! I have tryed to do this, but unfotunatly, when I lit the wool and spun it all I got was glowing wool, no flying sparks, can anyone tell me were I am going wrong please. Are you using the correct steel wool grading. You need to use Grades 0-0000 as they will produce greater sparks. If you are using anything above the Grade 1 steel wool, it will not produce sparks, as it is too thick. Also…what did you have your camera set on you didn’t say. I noticed no flash? please email me back with an answer…I’d appreciate it. How far away do you place the camera/tripod from the area where you will be spinning the steel wool? Hi, just wanted to ask you have any idea on why my steel wool doesn’t burn anymore? I used it in Australia and always burned really well, but now I’m in Taiwan, and it took so long to lit up, and once it’s lit, nearly no sparks fly off, my guess is the humidity, have you heard anything like this? Thanks. Frankie, Taiwan has a very smoggy atmosphere, with the worst being more towards the cities. I do not know if that is the cause of this, but it is some important knowledge. Also, are you purchasing the right type of wool? Whoah! Soooo awesome. Thanks so much for always sharing your knowledge, techniques, and strategies, much power to you! good tutorial with a lot of information and advice! Sorry for the late reponse. I’ve bought 0000 and 00’s and all worked well, with the previous problem I have, somehow a few weeks after that I went out to try again, and it worked….no idea what I’ve done, my best guess is the humidity. Thanks though. I noticed in the still image used as a display toward the end of your tutorial that the person – you? – was pretty distinct. 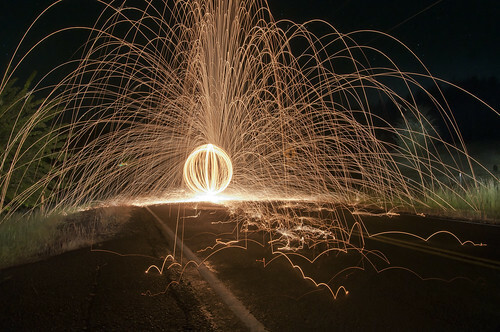 I’d love to be able to use steel wool fire photography to incorporate people too? Is it possible to use a burst of flash to accomplish that while preserving the fire scene? I’d found other on-line tutuorials about this, but yours was the simplest – so much so that I actually did it. Thanks for your help. Nice article, simply explained and very informative. I’m a bit late to this type of photography but can’t wait to give it a go, thanks for the inspiration! I STILL haven’t tried this yet. I will have to find a good location to give it a go. Thanks for the instructions.